"The truth is - ghosts are around us all the time." 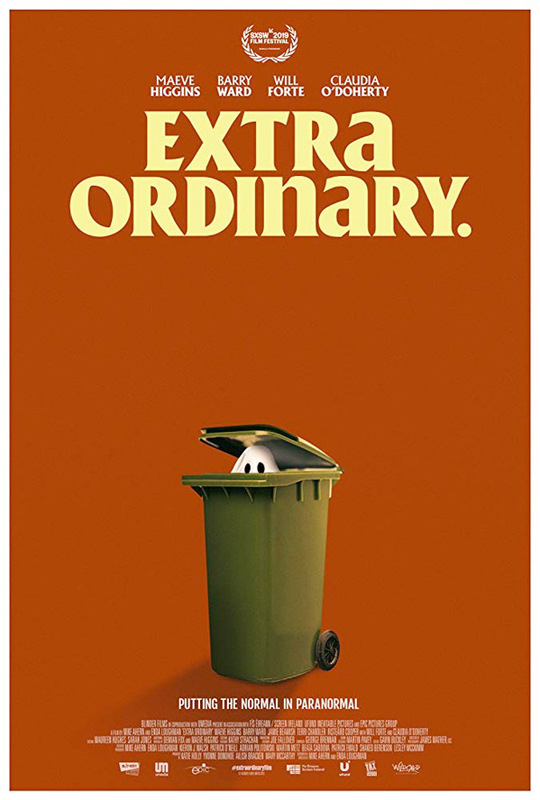 Epic Pictures Group has debuted the first teaser trailer for an Irish indie comedy titled Extra Ordinary, which just premiered at the SXSW Film Festival earlier this month. The story is about a sweet, lonely woman in rural Ireland with supernatural abilities, but hates using her "talents" and mostly just stays home. But when a washed up one-hit-wonder rock star makes a pact with the devil, and puts a spell on a local teenager, Rose must overcome her fears and save the day with her own supernatural talents. Maeve Higgins (seen on "Inside Amy Schumer" & "Moone Boy") stars as Rose, with Barry Ward, Will Forte, Claudia O'Doherty, Terri Chandler, Jamie Beamish, Emma Coleman, and Risteard Cooper. This looks like an amusing new horror comedy in the same vein as What We Do in the Shadows, with ghosts who don't do much scaring, or anything. Looking forward to catching up with this. Rose (Higgins), a sweet, lonely driving instructor in rural Ireland, is gifted with supernatural abilities. Rose has a love/hate relationship with her 'talents' and tries to ignore the constant spirit related requests from locals -- to exorcise possessed rubbish bins or haunted gravel. But! Christian Winter, a washed up, one-hit-wonder rock star, has made a pact with the devil for a return to greatness! He puts a spell on a local teenager -- making her levitate. Her terrified father, Martin Martin, asks Rose to help save his daughter. Rose has to overcome the fear of her supernatural gift and work with Martin to save the girl, get the guy and be home in time for a light snack… maybe a yogurt or something… Extra Ordinary is both written and directed by filmmakers Mike Ahern and Enda Loughman, making their feature directorial debut after a few short films previously. This just premiered at the SXSW Film Festival earlier this month. Epic Pictures is releasing the film, but it has no date set yet. Stay tuned for more updates. Who's interested?